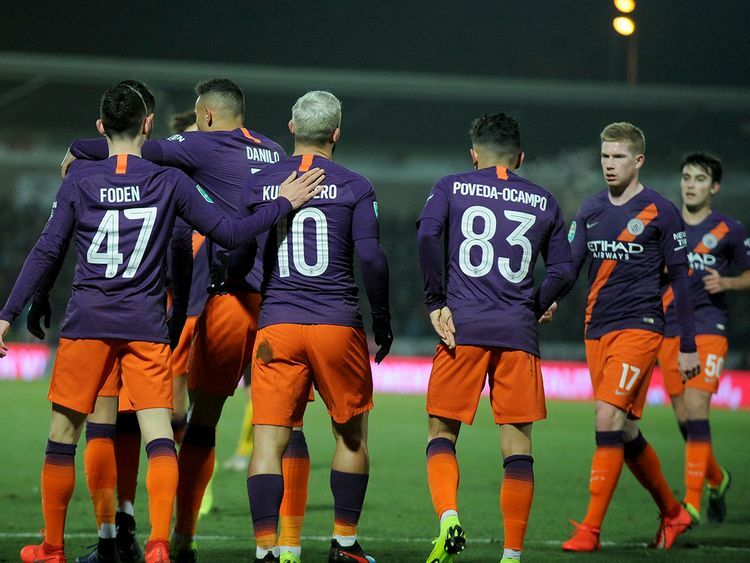 Burton-on-Trent, UK: Pep Guardiola admitted he was relieved Manchester City sealed their place in the League Cup final without any injuries in a 1-0 win on Burton’s “dangerous” pitch on Wednesday. Guardiola’s side had thrashed Burton 9-0 in the semi-final first leg earlier in January to effectively guarantee they would return to Wembley 12 months after winning the competition. Inevitably, City took it easier on the third tier minnows this time and Sergio Aguero’s first half strike was the only goal of a low-key second leg. But for Guardiola, the tie had been fraught with danger due to the slippery state of the surface on a freezing night at the Pirelli Stadium. “The pitch was so dangerous, so slippery,” he said. “Every game is completely different, we started at 9-0 up but I didn’t see a lack of desire. We played seriously, had no injuries. City will play Tottenham or Chelsea in the final on February 24, with Spurs holding a 1-0 lead ahead of the second leg at Stamford Bridge on Thursday. “It’s important to be in the final, it’s not easy to get to back-to-back finals, it doesn’t matter which competition,” Guardiola added. City’s emphatic victory broke the record for the biggest aggregate win in a League Cup semi-final, surpassing the mark they set with a 9-0 demolition of West Ham in 2014. Since losing at Leicester in the Premier League on December 26, City have won seven successive games in all competitions. There was more good news for Guardiola as France defender Benjamin Mendy returned to action after more than two months out with a knee injury. The English champions will continue their bid to win four major trophies this season when they face Burnley in the FA Cup fourth round on Saturday. With the tie all but over, Guardiola rested a host of players as he made eight changes against Nigel Clough’s team. The City boss handed a debut to 18-year-old winger Ian Carlo Poveda while there were also starts for Aro Muric, Phil Foden, Philippe Sandler and Eric Garcia. Aguero, Kevin De Bruyne, Riyad Mahrez and Fabian Delph were the established stars in the holders’ starting line-up. City went in front after 25 minutes when superb long ball by De Bruyne picked out Mahrez on the right flank. The Algeria winger cut the ball back to Aguero, who made no mistake with a first-time finish that flashed past Burton keeper Bradley Collins. Burton were almost gifted a chance when City goalkeeper Aro Muric got too casual and allowed a back-pass to escape his control, but the youngster recovered to clear off the line. The Brewers pushed again early in the second half and David Templeton wanted a penalty after colliding with Danilo, but referee Kevin Friend waved away the appeal. Aguero should have doubled City’s lead on the hour but missed the target from close range after being picked out by Foden’s cutback. Gabriel Jesus, who scored four in the first leg, came off the bench and almost added a second for City late on when his close-range effort was blocked.